﻿"...Always be prepared to give an answer to everyone who asks you to give the reason for the hope that you have." Avoid rehearsing your testimony as if you were memorizing a speech. Your goal is to be creative and real. This activity is intended to help put into words some of the important and interesting details of your own salvation and God's work in your life. A personal testimony can serve as a door-opener to spiritual conversation that may lead to an opportunity to share further about Jesus Christ. Also, you may sometimes find yourself in a situation where time only permits a short testimony. 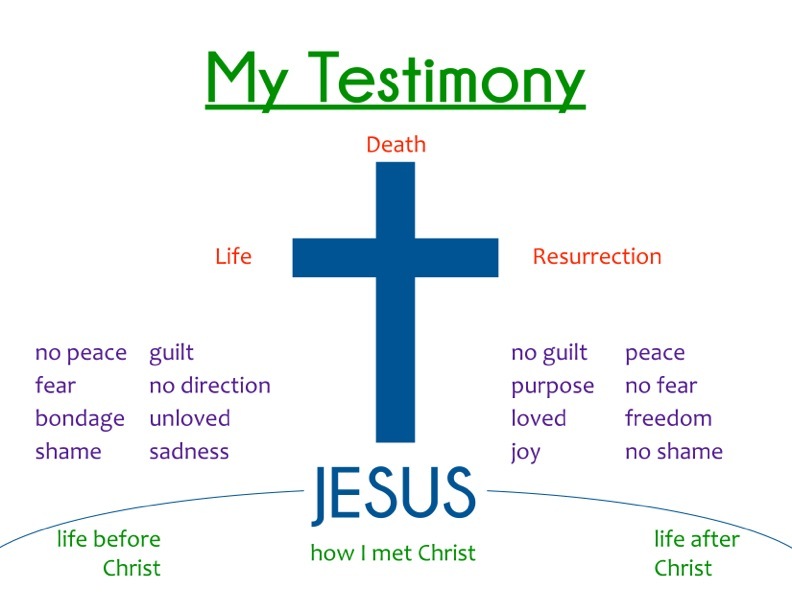 Be able to condense your testimony, if needed, but still get the point across. Be loving and bold when you sense the Spirit opening doors. Do not be scared to share how God has impacted your life. Let them see the character of God reflected in you. The goal in this section is for you to prepare a 2 minute testimony. Include just enough of your story to tell Jesus's story. Your hope is that they will ask you questions that will lead you further into the Gospel. The key thing to remember: THIS IS NOT ABOUT YOU! It's ALL about HIM. that you are sharing in. Just keep it real. - The penalty of sin is eternal separation from God. - Christ paid the penalty by dying on the cross. - JESUS IS ALIVE. God raised him from the dead. - Have you heard anything like this? - Do you have any questions about what I've shared? "So do not be ashamed to testify about our Lord...but join with me in suffering for the gospel, by the power of God, who has saved us and called us to a holy life - not because of anything we have done, but because of his own purpose and grace.